There's nothing quite as satisfying as a rich, hearty soup. This lactose free sweet potato chipotle soup features the perfect combination of decadent Cabot Farmhouse Reserve, tasty sweet potatoes and just a hint of cinnamon and chipotle to create a dish that's both satisfying and nutritious. This soup works well as an appetizer, and it's best when served with some fresh-from-the-oven bread. Make sure to rate and review this recipe after you've tried it—we're looking forward to hearing how much you like it! 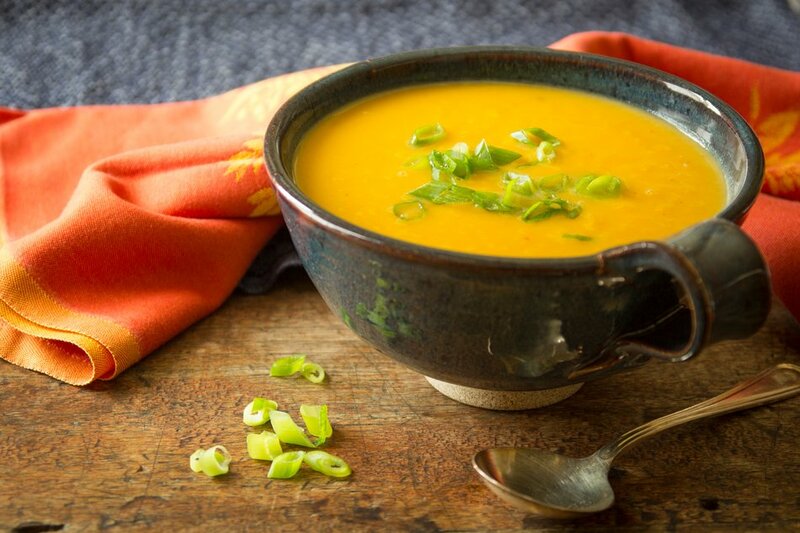 This sweet potato soup features a unique blend of spice and sweetness, and it's bound to be a popular dish in your home. This recipe calls for cumin and cinnamon (those spices will add a little extra flavor) as well as chipotle, which give this dish a real flavorful kick. 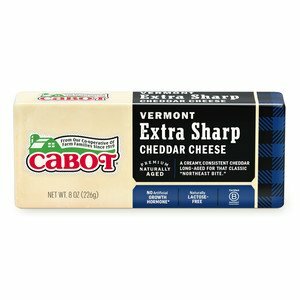 The six ounces of Cabot Farmhouse Reserve Cheddar will add some thickness to this soup, and tossing in some reduced-sodium chicken broth will definitely crank up the savory factor. This recipe makes seven (two-cup) servings, and it's a great dish to try as a fun and different appetizer. 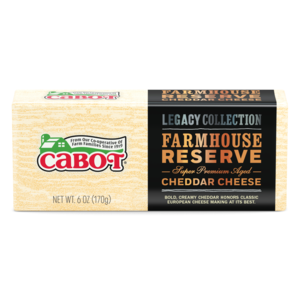 Cabot Creamery is a farm family dairy cooperative of over 1,000 farms throughout New England and New York. We take pride in our award-winning cheeses, and because we are based around a large collection of family farms, we understand just how important meals with the entire family can be. That's why we make sure that we provide only the most delicious and wholesome recipes on our site, and we want to make sure that you only serve the best at dinnertime. After trying this sweet potato chipotle soup recipe, please make sure to rate and review it—we love to receive feedback on our recipes. Also, feel free to share this recipe with your friends and family on Facebook and Twitter. We love our cheeses, and we can't wait to hear what you think of this recipe! HEAT oil in large heavy-bottomed pot over medium-high heat. Add onions, celery and salt and cook, stirring occasionally, until onion is softened and starting to brown, about 7 minutes. STIR in cumin and cinnamon and cook just until spices are fragrant, about 30 seconds. ADD sweet potatoes and broth, cover pot, increase heat to high and bring to simmer. REDUCE heat to medium-low to maintain gentle simmer and cook, uncovered, until potatoes are completely soft and falling apart, about 20 minutes. Add chili and vinegar and remove from heat. WORKING in batches, transfer several cups of sweet potato mixture to blender and puree (use caution when pureeing hot liquids). Alternatively, puree with immersion blender. Add cheddar to soup, stirring until completely melted. Serve topped with green onions. Lovely soup for a cold night. If I don't have any chipotle in adobo on hand I substitute a teaspoon of ancho chili powder and some smoked black pepper. I also prefer maple vinegar (1 tablespoon) rather than the apple cider vinegar. Toasted pumpkin seeds are a nice garnish. This was so good! My husband isn't a huge soup or sweet potato fan, but he loved this and said he'd have it again. It's creamy and velvety without being heavy. We opted for 2 chipotle chil's and used sodium-free chicken broth....was perfect! I love this soup. I made a batch a few days ago and have had it every day since. Don't want it to run out (cause it is a little tedious to make, but easy enough for an amateur). I added a little more cheese to give it a more bold flavor. Will make again! Love the subtle flavors in this recipe. I'm a big fan of cumin and chipotle and added a bit more of each than recommended. Will definitely make again! !